OData Introduction and Querying Existing OData Service – Part 1. Create read-only OData endpoint using Asp.Net Web API – Part 2. CRUD Operations on OData endpoint using Asp.Net Web API – Part 3 (This Post). 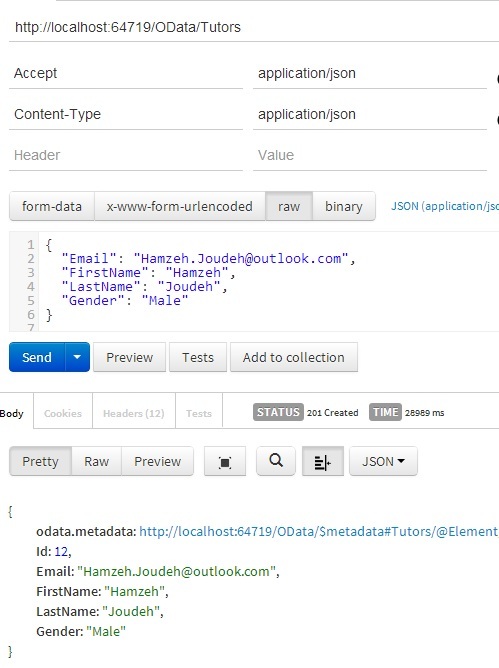 Consuming OData Service using AngularJS and Breeze.js – Part 4 (Coming Soon). In this post We’ll add another OData controller which will support all the CRUD operations, as we talked before OData follows the conventions of HTTP and REST; so if we want to create a resources we’ll issue HTTP POST, if we want to delete a resource we’ll issue HTTP DELETE and so on. One more thing we want to add support for is partial updates (HTTP PATCH) which will be very efficient when we update certain properties on the entity, the request payload for PATCH will come on a key/value pair and will contain the properties changed only. 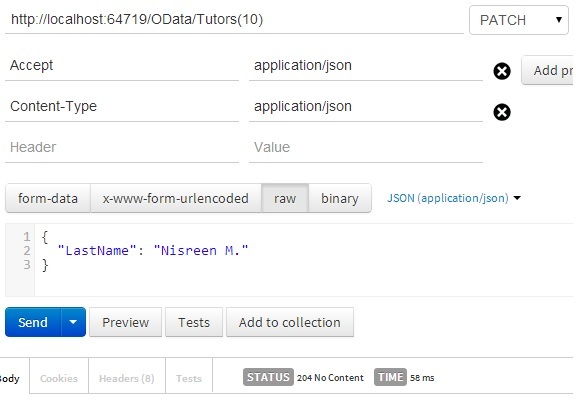 Let’s add a new Web API Controller which will handle all HTTP requests issued against the OData URI “/odata/Tutors”. To do this right-click on Controllers folder->Select Add->Name the controller “TutorsController” and choose “Empty API Controller” Template. By looking at the request above you will notice that status code is 201 created is returned as well the response body contains the newly created Tutor, but what if the client do not want to return a duplicate entity of the newly created Tutor from the server? The nice thing here that OData allow us to send Prefer header with request to indicate if we need to return the created entity back to the client. The default value for the header is “return-content” so if we tried to issue another POST request and pass the Prefer header with value “return-no-content” the server will create the resource and will return 204 no content response. To test this out we need to issue HTTP DELETE request to the URI “OData/Tutors(12)” and if the tutor exists the HTTP response will be 204 no content. What worth mentioning here that if we tried to delete a tutor which doesn’t exists then by looking at code on line 6 you will notice that I’m throwing HttpResponseException with status code 404 along with empty response body; nothing wrong about this but if you want to build OData compliant service then handling the errors should be done on a different way; to fix this we need to return an HttpResponseException with an object of type “Microsoft.Data.OData.ODataError” in the response body. Before we send the request Let’s open SQL Server Profile to monitor the database query which will be generated to update this Tutor, you will notice from the image below how efficient is using the Patch update when we want to modify certain properties on an entity, the query generated do an update only for the changed property. Please drop your questions and comments on the comments section below. Hi! Thanx for this post. But I have a problem. Do you know why the “entity” parameter in method CreateEntity is null, when I try to call service to create new entity? If the above work then ensure that you set the right Content-Type header when you issue POST request in JS, as well check your data format in JS object. Hi Taiseer, Thanks for the wonderful post. A small query on POST. Taking your example, if a new course needs to be created using existing TutorID and SubjectID, how can this be acheived? Whenever SaveChanges method is called, it expects all foreign keys objects and creates a new records in Tutor and Subject table. In your web api tutorial, I came across with “parse” method inside ModelFactory class. Can anything similar be used here? Hi Taiseer, thanks for this tutorial, once again very clear and works well. I noticed this doesn’t use the repository/model concept from the WebAPI tutorial,. Are these still relevant when using OData? If so, how would they fit into your example? Apologies for the late reply, well you can use the repository pattern with OData endpoints for sure. Mainly you can use the repository pattern for creating an abstraction between your domain objects and data layer. Hope this answers your question. Thank you, really glad this was useful for you 🙂 subscribe to blog to keep updated. Glad you liked it, will blog the last part soon. Just curious, did you ever do the final part about Angular & OData? A helpfull tutorial (as are all of your tutorials). Looking forward to the AngularJS part 4. I just have a small question. Is there a way to add support for PATCH with traditional ApiController? You are welcome Khai. I didn’t do it my self but yes sure there is way to implement patch, check this SO answer, hope this helps. I will be lying if I said yes 🙂 I’m now working on another tutorial related to Angular, so keep tuned. Thanks so much for the demo. Great learning tool. I’m having a problem. When I compile to the solution no database is created. I changed to connection string to connect to my MSSQL 2012 database server and still noting is being created when I compile the solution. Any help would be appreciated. Hi Kai, the DB will be created once you do first hit to the DB not compilation, like calling DbContext.Students.ToList() as well make sure that initialization strategy is set correctly. Not really sure what the problem is, but I’m still not able to run the app. I unzipped the demo code again and open the solution in VS2013 and I’m not able to get the site to run. I’m not making any code or web.config file changes. I made the Learning.Web project the start up site. Any help would be awesome. The code compiles with no errors. What do you mean the site is not running? You can not issue requests? Is there any errors after you execute the request? I should have been more specific. Yes, I’m not able to issue any request. I don’t get any compile errors at all. Looks as if it a problem with the CreateEntity method found in the TutorsController.cs file. I’m wondering if this is because the database is not being created. I finally got the the code to work. I think my biggest problem was the database was not getting created for some reason. I changed the connection string to point to my local instance of MSSQL 2012 and everything works. Once I learn this I’m going to take a look at the password \ account demo you have posted. This is just want I need and what I’m trying to learn.